Ed says: After a spectacular aerial display during our Feb. 18th CIX Birthday Bash, Max's Chipmunk is seen taxing in for a standing ovation from all assembled, with another member of the demonstration team in the background. 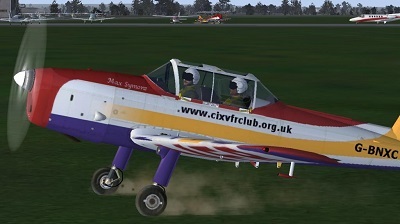 The CIX VFR Club is a group of Flight Simulation enthusiasts who enjoy flying extremely realistic simulated light aircraft, chiefly around the United Kingdom, across a computer generated landscape made up of real photographs, and within an Internet community environment. We have around 700 registered members in 63 countries, which reflects the world-wide appeal of aviation simulation. We "meet" mainly on weekday evenings and some other organised occasions, to practise our flying skills and hold events such as group fly-outs to distant aerodromes or challenging navigation exercises. During these activities, we enjoy discussion and banter on our dedicated TeamSpeak VOIP application. Between meets we exchange news, views and ideas, and provide help and advice on a wide range of aviation related topics on our Club Forum. Members "fly" in FSX, FSX-Steam, X-Plane or Prepar3D, according to their preference. Using free Multiplayer software, we can see each other's aircraft as we fly. We even have our own virtual Airshows! We enjoy realistic, live, simulated Air Traffic Control, thanks to virtual Air Traffic Control Simulator networks VATSIM, and its UK Division VATSIM-UK or alternatively, the similar system IVAO, and its UK and Ireland Division. Because it is very much less expensive than flying real aeroplanes, but as realistic to the real world as we can achieve (except that we can magically switch off any bad weather!). We can also go where no real plane can go and see things one can never see in the real world. We fly all over the world, fly both modern and vintage aircraft, build online friendships and talk to many people in other countries. There are both national and international events in which we can take part. A number of members are real-world pilots or air traffic controllers, so we are well eqipped to make flight simulation "As real as it gets". Within VATSIM and IVAO, as well as a number of groups like ours, there are many "Virtual Airlines", some copying the routes and aircraft liveries of real world airlines, whose pilots fly the aircraft they have always dreamed about flying - Boeing, Airbus and many more. We all meet in the virtual skies and at airports in the simulators, managed by the air traffic control systems. The CIX VFR Club Members have the common aim of simply having fun in a simulated aviation environment. (We take our flying seriously, but not too seriously). We welcome new members at any level of flight-simming ability to come and try the lighter side of aviation - in more ways than one. We have lots of varied activities involving light aircraft flying on-line with others and with live ATC, creating one of the most exciting branches of the Flight-simming hobby. Many firm friendships are also made in the Club, even though most members rarely meet face to face. Interested in joining? See details on the Membership page. Previous experience of aviation or of Flight Simulator is not necessary. We help newcomers in many different ways and hopefully pass on to them some of our enthisiasm. We operate a training programme for pilots new to Flight Simulation, for FSX and its derivatives and X-Plane. Training is voluntary, and provided to match the members' needs, from the basics of flying to help getting into the virtual Air Traffic world. The instructor shares the student's aircraft guiding him through a lighter version of the real world Private Pilot's syllabus, with the emphasis on fun not work! For more information See details on the Training page. A key part of Club life is the Forum, which has had over 121,000 posts as of 1st March 2018 since its inauguration in February 2004. As well as flying, you can join in lively craic in the Members' Bar where we chat about almost every facet of flying and flight-simming, including tips and tricks (and yarns) from real world pilot members. We can also help with computer problems as we have a number of very talented IT specialists in the Club. In fact help on almost any subject is only an internet connection away. VATSIM operates a scheme of voluntary Pilot Qualifications, attained by suitable training and tests. The Club is authorised to train for and award Pilot Ratings at P1, P2 and P3 levels. For full details see the VATSIM Pilot Ratings Page. Click on the icon below to see which of our club members are online now.